Use from() to start processing a regular Publisher in 'rails'. Use runOn() to introduce where each 'rail' should run on thread-vise. Use sequential() to merge the sources back into a single Flowable. Allows composing operators, in assembly time, on top of this ParallelFlowable and returns another ParallelFlowable with composed features. Generates and concatenates Publishers on each 'rail', optionally delaying errors and generating 2 publishers upfront. Generates and concatenates Publishers on each 'rail', optionally delaying errors and using the given prefetch amount for generating Publishers upfront. Call the specified consumer with the current element passing through any 'rail' after it has been delivered to downstream within the rail. Run the specified Action when a 'rail' completes or signals an error. Run the specified Action when a 'rail' receives a cancellation. Run the specified Action when a 'rail' completes. Call the specified consumer with the current element passing through any 'rail' and handles errors based on the returned value by the handler function. Call the specified consumer with the current element passing through any 'rail' and handles errors based on the given ParallelFailureHandling enumeration value. Filters the source values on each 'rail' and handles errors based on the returned value by the handler function. Filters the source values on each 'rail' and handles errors based on the given ParallelFailureHandling enumeration value. Take a Publisher and prepare to consume it on multiple 'rails' (number of CPUs) in a round-robin fashion. Take a Publisher and prepare to consume it on parallelism number of 'rails' in a round-robin fashion. Take a Publisher and prepare to consume it on parallelism number of 'rails' , possibly ordered and round-robin fashion and use custom prefetch amount and queue for dealing with the source Publisher's values. Wraps multiple Publishers into a ParallelFlowable which runs them in parallel and unordered. Maps the source values on each 'rail' to another value and handles errors based on the returned value by the handler function. Maps the source values on each 'rail' to another value and handles errors based on the given ParallelFailureHandling enumeration value. Merges the values from each 'rail' in a round-robin or same-order fashion and exposes it as a regular Flowable sequence, running with a default prefetch value for the rails and delaying errors from all rails till all terminate. Merges the values from each 'rail' in a round-robin or same-order fashion and exposes it as a regular Publisher sequence, running with a give prefetch value for the rails and delaying errors from all rails till all terminate. Sorts the 'rails' of this ParallelFlowable and returns a Publisher that sequentially picks the smallest next value from the rails. Subscribes an array of Subscribers to this ParallelFlowable and triggers the execution chain for all 'rails'. Perform a fluent transformation to a value via a converter function which receives this ParallelFlowable. Validates the number of subscribers and returns true if their number matches the parallelism level of this ParallelFlowable. prefetch - the number of values to prefetch from the source the source until there is a rail ready to process it. errorHandler - the function called with the current repeat count and failure Throwable and should return one of the ParallelFailureHandling enumeration values to indicate how to proceed. This operator uses the default prefetch size returned by Flowable.bufferSize(). The operator will call Scheduler.createWorker() as many times as this ParallelFlowable's parallelism level is. 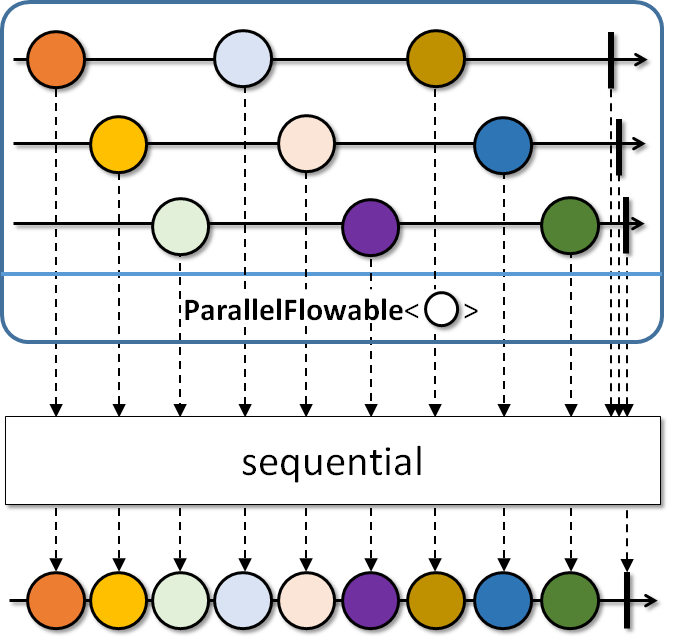 No assumptions are made about the Scheduler's parallelism level, if the Scheduler's parallelism level is lower than the ParallelFlowable's, some rails may end up on the same thread/worker. sequential does not operate by default on a particular Scheduler. sequentialDelayError does not operate by default on a particular Scheduler. This operator requires a finite source ParallelFlowable. tillTheEnd - if true all errors from the upstream and inner Publishers are delayed till all of them terminate, if false, the error is emitted when an inner Publisher terminates.